The Lesson for Thursday looks at the early church’s harmony and dedication and from their example, draws lessons for church evangelism today. 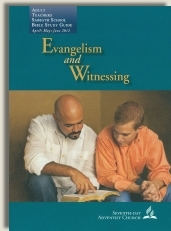 Among the key principles mentioned are the ability to work together without conflict (harmony), involvement of all members, and “humility, death to self, willingness to forgive.” Friday’s Lesson looks at setting realistic time frames for setting up evangelistic and witnessing programs. Rotary International would heartily agree to the key principles presented in Thursday’s Lesson. We need to ask, however, can common idealism explain the driving motivation of the early church in Acts? Did the apostles merely make good use of universal organizational principles? Or, was there something unique and unprecedented about the early Christians, giving them such unity and fervor? Let’s look closely at that first chapter in Acts. 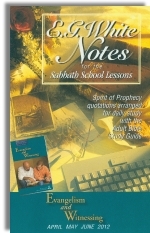 The first 11 verses tell of Jesus’ resurrection, His final instructions and promises of the Holy Spirit. Then He ascended out of sight. The days following, the 120 believers spent their time together in fellowship and prayer. Their main topic of thought and conversation was Jesus and His mighty works. They were not discussing good organizational principles or making 12 month plans. They knew nothing about evangelism and huddled in secret, wondering if they would be killed. They were not motivated by fear, however, for they were obsessed with their king, Jesus, and how He fulfilled scripture to bring in the kingdom of God. They were the early church. Peter said it: “The scripture had to be fulfilled.” Peter is referring to the betrayal and death of Judas. Jesus Himself had stated that Judas’ betrayal was a fulfillment of prophecy, predetermined by God, although adding that Judas was still fully responsible for his actions. “The Son of Man goes as it is written of him, but woe to that man by whom the Son of Man is betrayed! It would have been better for that man if he had not been born” (Matt. 26:24). God’s sovereign authority was vindicated even in Judas’ terrible sin and tragic death, for he only served the greater purpose of Jesus suffering and dying. The horror of all this could only fulfill scripture and serve God’s sovereign purposes. The Holy Spirit, through Peter, is showing us that the same sovereign purposes of God, stated in scripture, were guiding them to choose a successor to Judas. The eternal purpose of God was for Jesus, the Eternal Word, to become a man and live among sinners to suffer and die for them. All history turned around that great hub, and in the upper room, all their activities and thoughts also turned around that center. When they chose the new apostle, the two qualifications centered around the life, death, and resurrection of Jesus (Acts 1:21, 22). Everything that happened to the early church, especially the outpouring of the Spirit’s power, was centered on Jesus. Even the work of God the Spirit must center on Him: “But when the Helper comes…he will bear witness about me” (John 15:26), and, “When the Spirit of truth comes, he will guide you into all the truth, for he will not speak on his own authority, but whatever he hears he will speak” (John 16:13). The Holy Spirit serves Jesus, bears witness of Jesus, and not of Himself. Christ followers throughout the ages are motivated by a passion for the testimony of Jesus. They live and breathe His life and death, and overcome by His blood. There is no greater motivation for our Christian witness than personally knowing the end of all God’s purposes, Lord of History. No other organization shares that passion, and no marketing strategy can duplicate the power of the testimony of Jesus. His followers will love Him, even unto death.